Over the weekend I traveled to Chicago for the Lie-Nielsen Tool Event at Jeff Miller’s studio and had a great time hanging out and chatting with everyone. When I originally posted I was planning to visit for the day I mentioned it had been a few years since my last visit, and man am I glad I made it this year! First of all, I can’t say enough about how much I enjoy having an opportunity to hangout with fellow woodworkers and being able to get a little hands on with some tools. But the chance to stand around and have a conversation with Jeff is like the cherry on top. I know I mentioned this years ago, but one of the first classes I took in woodworking was with Jeff. I can easily say I walked away with a ton of information (way more than I ever expected from an afternoon-long class) so I can only imagine what those of you who have taken classes spanning several days, especially on the topic of chair design and construction, have experienced. Speaking of chairs, this picture posted above is of one of Jeff’s latest masterpieces. The “Toccata Chair” was on display in the showroom, but the prototype was in the heart of the workshop and received a lot of attention. I couldn’t resist sitting in it myself and can only say that if I ever attempt to build a chair as beautiful as the Toccata I hope it turns out almost as nice as the rough “prototype” I sat in! Another topic that came up, partly because I asked and also because Mark Hicks from the Plate 11 Bench Company was at the event too, was some suggestions about workbench vises. It’s no secret I have plans to make a new bench for myself this year, when exactly it’ll happen I can’t say but this visit was a great opportunity for me to pick Jeff’s brain on the topic, especially when it comes to workbench equipment like tail vises. What makes Jeff such an expert on benches? Well for starters he wrote an article on it for Fine Woodworking Magazine and the plans are available thru Taunton Press. If you’re still not familiar with Jeff Miller, he has an impressive resume of articles he’s written for some of our favorite magazines. You’ll find them in both Fine Woodworking and Popular Woodworking and they range from tool tests to design and even some articles on some amazing jigs for helping you get the most from your hand tools. 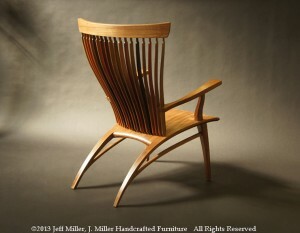 And of course for even more information about Jeff, including upcoming classes, visit his website at www.furnituremaking.com. I had a GREAT time hanging out with Jeff and the gang at the FORP build last year. I was sorry to miss the chance to hang out at his shop, but there will be other opportunities. Glad you had a good time!